This spiced blueberry pie recipe can use fresh or frozen berries for a fantastic year round pie. Its earthy spices and rich flavor are enticing and delicious, and a perfect alternative to traditional pie. Note: This post was updated on September 3, 2018 with new content for your enjoyment. This blueberry pie recipe is unlike anything you’ve ever tried before. It has rich, earthy spices and flavors that you don’t usually think of pairing with fruit pies. The flavor profile of the spices is autumnal and wintery, making it perfect for Thanksgiving or Christmas. It’s also a great alternative to pumpkin or apple pie at your holiday dessert table. I know this [winter-ee] pie should have probably been baked during a cooler, more festive season. But it honestly went just as well for a gathering with friends in the springtime as it would have in the winter. It makes a delicious after dinner dessert. This is the least sweet pie I have ever tasted and I grew a very slow, odd appreciation for the lack of sweetness with each bite. Pâte Brisée Pie Crust. Get my favorite pie crust recipe and learn everything you need to know about making a pie dough from scratch or in a food processor. This also has tips for what to do if your blueberry pie gets a soggy crust. How To Buy & Store Spices. 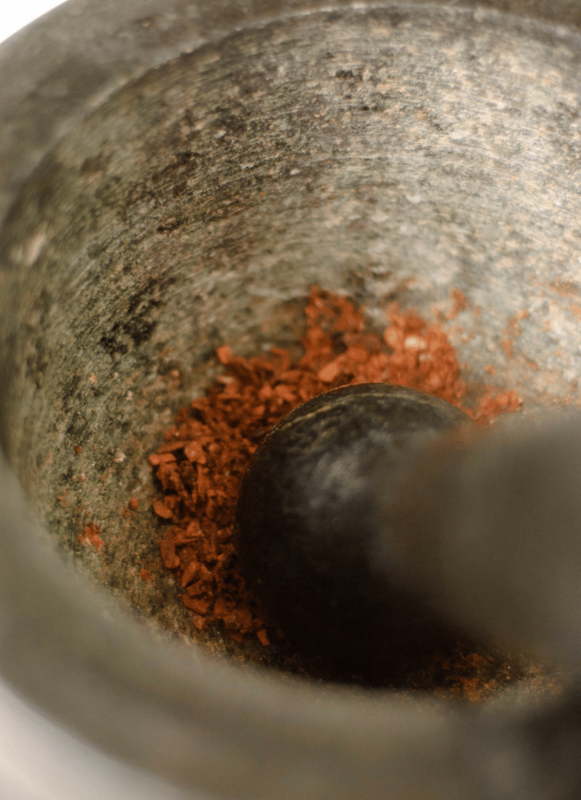 Learn the eight types of spices and how to buy and store them for best flavor and freshness. How to Buy & Store Berries. This has everything you need to make sure your fresh blueberries stay good until it’s pie making time. Does Blueberry Pie Need To Be Refrigerated? No. As long as your home doesn’t get outrageously hot, your homemade blueberry pie does not have to be refrigerated. Fresh blueberry pie will last at room temperature up to three days. Make sure to cover it in some way; plastic wrap, cake plates, and Tupperware all work well. TIP: With this pie specifically, the longer your pie sits the stronger the spices will be. The flavor will be much more dominant on day two compared to a couple hours out of the oven. If you want it to last longer than three days, you can refrigerate it for five to seven days. However, that’s not five to seven days after it’s been left at room temperature. That’s after cooking and cooling. Should I Use Fresh Blueberries or Frozen Blueberries For My Blueberry Pie? The great thing about this blueberry pie recipe is that it works with either. It measures the blueberries by weight so you can use either fresh or frozen berries. If you use fresh blueberries, make sure to double check for any rogue stems. If you’re using frozen blueberries, you’ll have the best success if you thaw them out first. Frozen blueberries take about four hours at room temperature to thaw completely. The cardamom crust adds a fantastic flavor layer to this pie. You don’t have to make a homemade pie crust to do this though. If you are using a store bought pie crust, sprinkle the cardamom on the dough and lightly press it in. Before you bake, turn the side that you sprinkled the cardamom on against the pie pan. 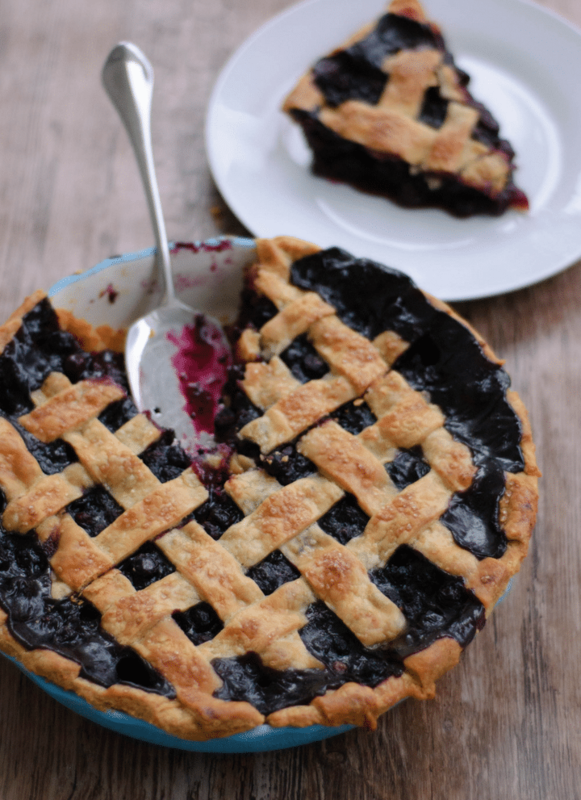 Want a free printable grocery list for this spiced blueberry pie recipe? Get it HERE. Prepare the cardamom pie crust and roll out two 13" circles of pie dough. Place one into the bottom of a pie pan letting the excess dough hang over the edge. Place both into the refrigerator to chill while you prepare the filling. 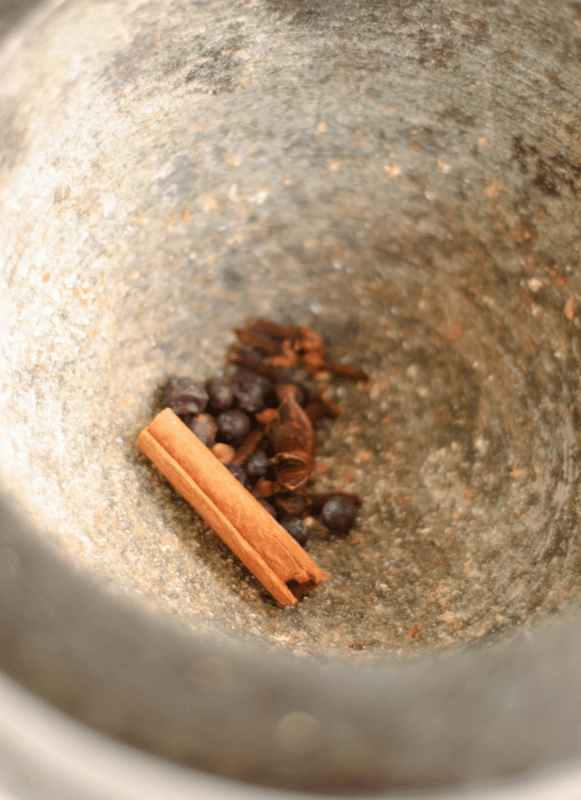 Using a mortar & pestle or a spice grinder, grind the juniper berries, star anise, cloves, and cinnamon until fine. 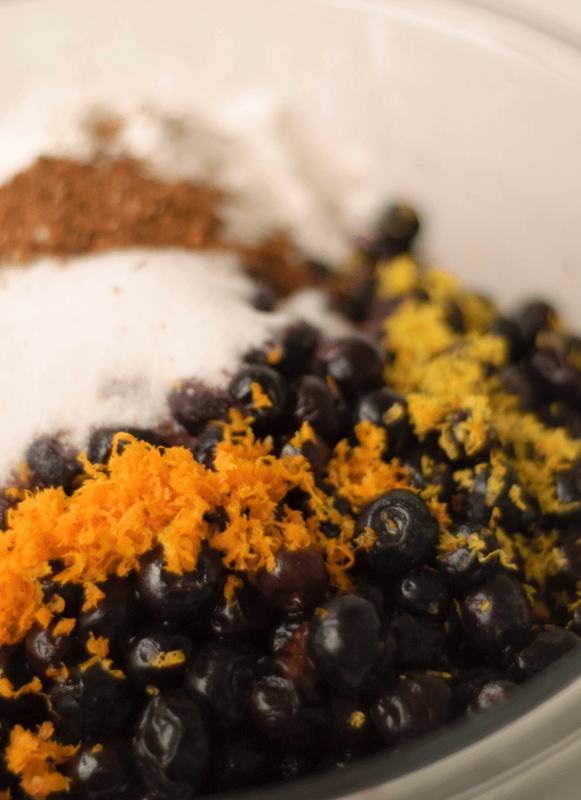 In a large bowl, combine the blueberries, orange zest, lemon juice, lemon zest and sugar. Let sit for 10 Minutes. Add cornstarch, vanilla, and spice blend to previous blueberry mixture and stir until combined. Remove the pie pan from refrigerator and fill with spiced blueberry mixture. Place it back in the refrigerator while you prepare the top crust. Prepare the second 13" disc of pie crust in desired pattern/style. Remove the filled pie dish from the refrigerator and add the top crust. Use the prongs of a fork to firmly press around the edges. This adheres both crusts together. Remove the pie from refrigerator and brush the crust with heavy cream over Sprinkle with the sugar in the raw. Place the pie on sheet pan lined with parchment paper or aluminum foil and bake for 20 Minutes. Drop the temperature to 350°F. Continue to bake for another 45 Minutes or until the crust is golden brown and the pie filling bubbles. Yum! This pie though. It makes me want to pick blueberries, like now! (too bad it’s December!) I’d be happy though baking it tonight, smelling all the winter spices, and snuggling up on the couch with a warm slice of it. Looks delicious! I know, right? I always stock up on fresh blueberries in the summer and freeze them to make this pie in the winter. The crust on that is making me drool! It looks amazing! Thank you, Michele! I just love the cardamom in it. It really takes it up a notch!